Google Cardboard is a revolution in the VR industry. It’s an unbelievably simple technology: a pair of lenses, a magnet, and a cardboard box. Despite its primitive design, Google Cardboard creates quite deep virtual reality experiences. 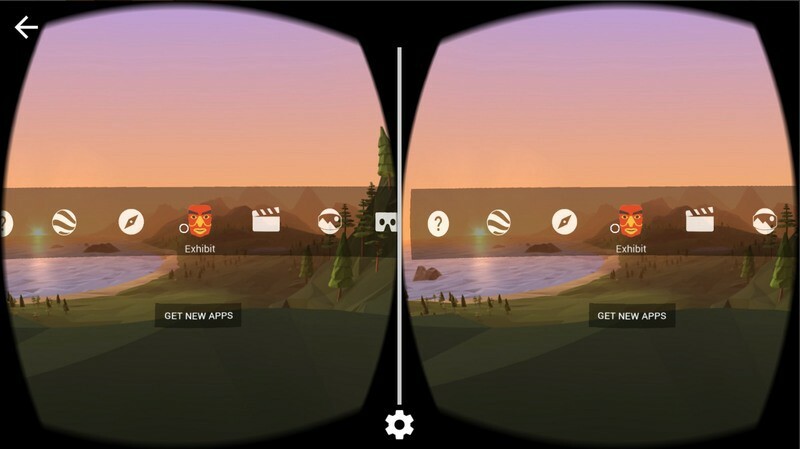 Let’s discover the best Google Cardboard apps the VR market has to offer. The majority of them are freemium apps, with optional in-app purchases or ads to help the publisher with monetization. Don’t know where to start? Try the official free-of-charge Google Application for Cardboard. Basically, it’s a VR interface for your smartphone. This app is perfect for configuring and launching your favorite experiences. You can use it to search for new apps for Google Cardboard. My videos — the app creates an enormous screen for you to enjoy your videos. Earth — developers integrated the Google Earth functionality in GCA; you can fly around the globe and explore our planet from above. Exhibit — the app displays cultural artifacts for you to examine. Arctic Journey — it’s an arctic experience; northern sightseeing with GCA is breathtaking. The majority of mobile users already have the YouTube software on their devices. If you do not, well, it’s about time you installed it! YouTube has a whole VR universe. You will be surprised at how much 360-degree video content you can find in this free app. From artist studio broadcasts to 360-degree mountain expeditions — we are sure you will find something to your liking. Whether you are a user of iPhone or an Android-powered device, it is definitely worth a shot. If you are looking for the best Android VR apps with truly calming immersive experiences, have a look at Lanterns. This application conveys the peaceful ambiance of the Lantern Festival celebration. It’s a traditional festival in China, Indonesia, Malaysia, Singapore, and some other East Asian countries. 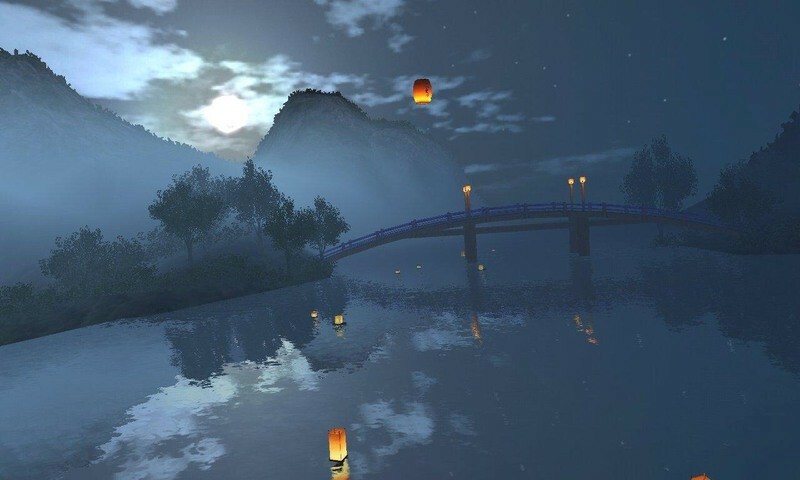 The free Lanterns App creates a truly fascinating scene with a customizable amount of lanterns and a full day-night cycle. Give it a try and enjoy the harmonious dance of little twinkles on water and in the air. Mobile virtual reality technologies are continually improving. Nowadays, apps allow you not only to be a virtual world observer but a first-person game player. 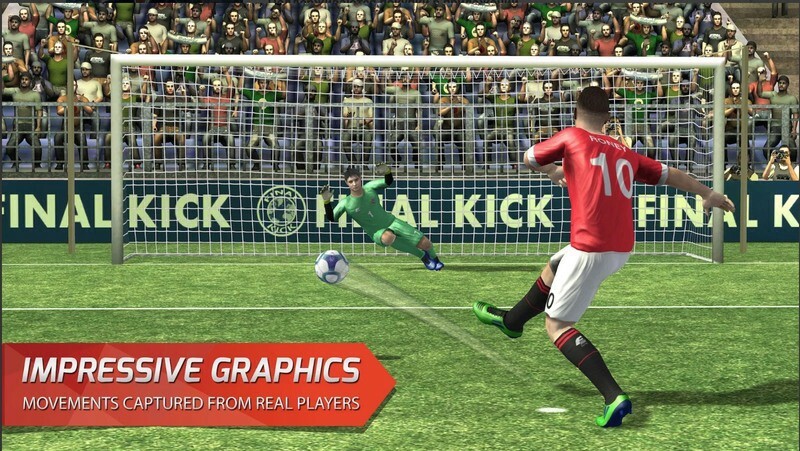 Final Kick VR is an exciting soccer game available for free on Android and IOS. Intuitive controls — some devices won’t connect to Bluetooth pads; since this game is easy to play with solely with a headset, it has an indisputable advantage over the others. Decent Graphics — realistic physics along with amazing graphical effects are super entertaining. Diverse gameplay, even offline — Final Kick VR offers 20 tournaments with 100 soccer teams without an Internet connection. Free of charge — while some games force you to make in-app purchases, Final Kick’s paid functions are 100% optional. If you are a soccer fan and seek an immersive virtual reality experience, download Final Kick VR and try it out. Are you a space-curious person? Do you want to explore the wonders of our universe? Consider adding this astonishing application to the collection of Cardboard apps on your phone. Free to install and use, this app will become your guided tour to our solar system and several other stars. Titans of Space shrinks the space objects to 1 millionth of their size, so it’s easy to compare them. Titans of Space delivers visual and aural satisfaction at the same time. A dynamic soundtrack follows your tour and helps to immerse you more deeply into infinite outer space. In-app purchases unlock the 50-minute voiceover. Stay informed by the guide during the whole tour. 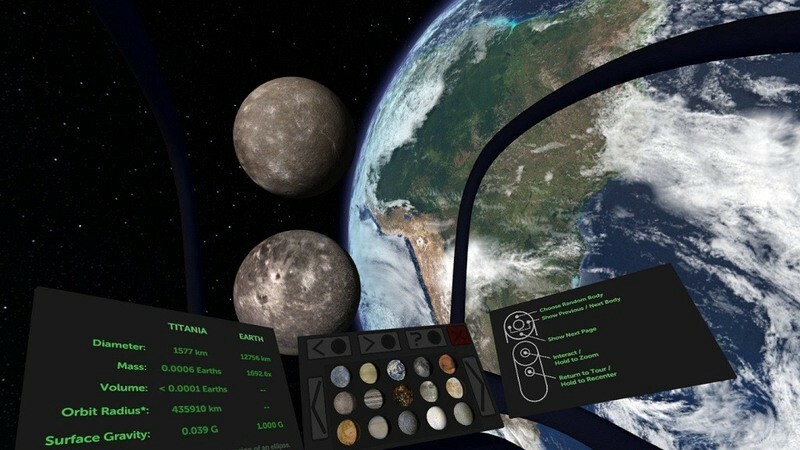 This optional feature makes the space-traveling both entertaining and educational. Bear in mind that this application consumes a significant amount of device power. Make sure to shut down as many unnecessary background tasks as possible. The software provider covers the main Q&A points on the app page in Google Play. Don’t forget to go through them. Expeditions is one of the top Google Cardboard apps in the educational section of Google Play. But don’t be quick to dismiss informative content. We are dead sure Expeditions will prove to you that education can be fun and exciting. What is so special about this free app? First of all, Expeditions supports group tours, meaning you can actually use it with your friends to virtually travel together. Just connect your devices over the Wi-Fi network, and you are good to go! A growing list of over 200 preset expeditions, immersive VR experience, and some features for creating educational classroom experiences allow you to use Expeditions as a teacher! Spend time with your family or friends discovering historical and just marvelous places all over the world. 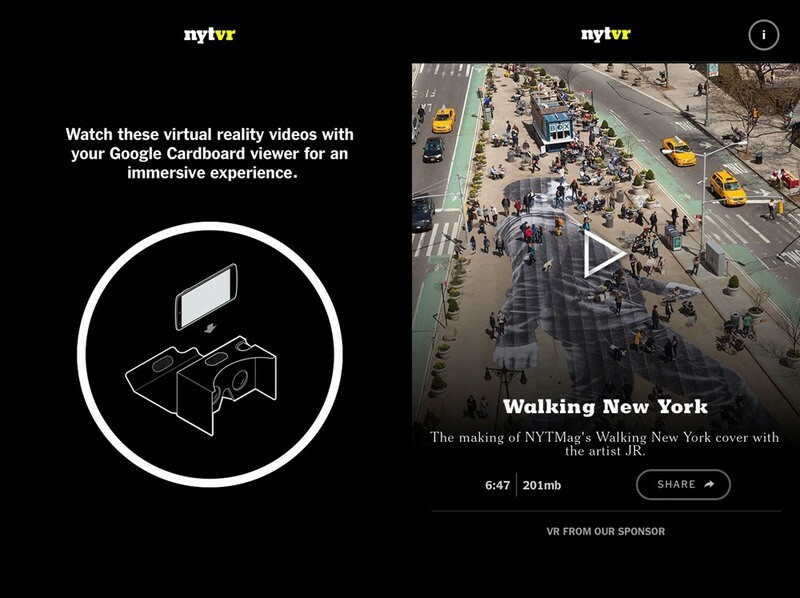 NYT VR is an app full of award-winning VR films and immersive video experiences. Watching the news has never been this entertaining! The New York Times app tells you about everything in the world in an exciting way using VR. Dive into realistic 360-degree videos of military conflict in Western Asia, see the incredible footage of Jimmy Chin climbing the spire of the World Trade Center, or anything else that is on the regular news! You can stream videos or download them if you have a low-end Internet connection, so there are no comfort limitations on your VR experience whatsoever. If you are fond of news or just looking for a fresh VR, New York Times application will be among your best apps for Cardboard. Considering how popular the Star Wars franchise is, we put this masterpiece on the best Cardboard apps list. Tons of positive feedback, diverse and engaging gameplay, free-of-charge content — all these points are signs of a good app. Let’s find out more about this connector to a galaxy far, far away. Side-themed interface — whether you choose the Light Side, Dark Side or even go for Droid design, Star Wars VR delights you with the thematic visual and sound design; you just have to see this outstanding animation effects. Aggregated feeds — the app allows centralized subscription to official social channels and creator blogs. Become Jakku Spy — this awesome serialized feature delivers a great immersion into Star Wars: The Force Awakens. Explore the galaxy content — read the official news, watch creator interviews and Star Wars-themed videos, behind the scenes footage, etc. 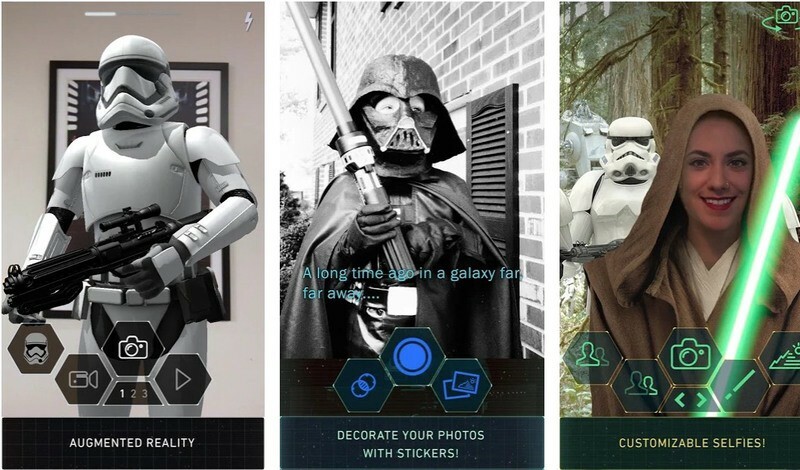 The Star Wars app is undoubtedly a mother load for fans of the franchise. Check it out, and may the force be with you! Google Cardboard technologies are developing faster and faster. VR apps now have entertaining and educational qualities at the same time. Keep in mind that a deep immersive virtual reality experience requires headphones. Take your time, pick one of the listed applications and start your marvelous VR journey. It’s a perfect opportunity to have a nice time and broaden your horizons. Personally we love VR apps, trying them out as well as creating new apps for our clients! We recommend anyone immerse in this wonderful technology. 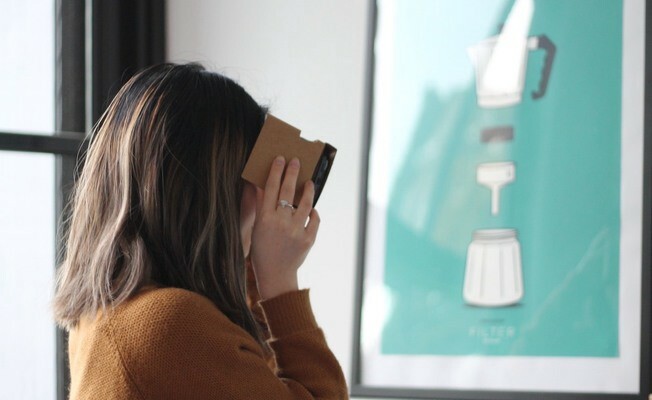 8 Best Apps for Google Cardboard was originally published in Hacker Noon on Medium, where people are continuing the conversation by highlighting and responding to this story.